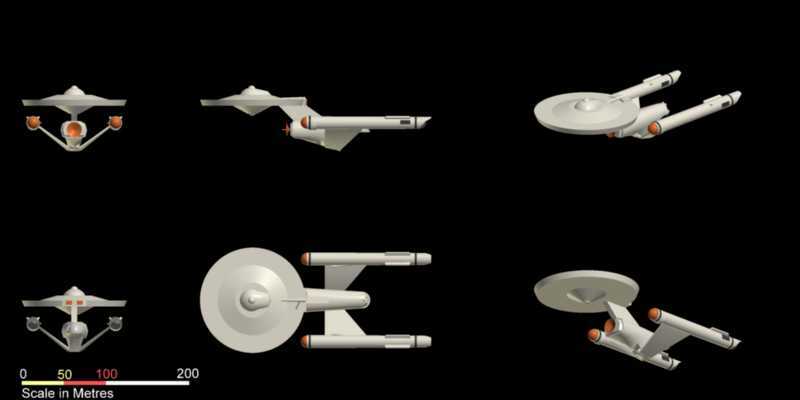 The Voyager class was a low cost refit of the final 20 Vindicator class Frigates, using the same concept as the Constitution class based Endeavour class. The Vickers SCNN self contained Linear Warp drives offered a way to update relatively new hulls in a more affordable way, which was also far quicker than the full scale rebuild option. The Voyager class served loyally for 30 years, latterly in second line duties. Although deemed old fashioned by some they performed valuable work, and were surprisingly sought after postings as they retained the older style internal and external aesthetic and use of space until their eventual retirement. The Coventry differed from the Surya by having an extended rear edge to the primary hull to house extended hangar decks. These hangars often carried Attack ships as well as the more usual shuttles. Some ships of this class served 50 years in the fleet. The Surya class was designed as a Frigate counterpart for the the Constitution class. The ships had useful hanger capacity in the rear of the primary hull, and, along with the Miranda class, set the basics for classes to follow from the Coventry through to the Avenger/Reliant.